An article I wrote many years ago (parts of it was written for my dissertation) has been published in Ekman, Rydell Johansén (red): Soteria och Gnosis – Frälsning och kunskap i den tidiga kyrkan. It is good thing that it has been in the pipeline for so long, based on my cv now it seems like I can dish out some patristics while working activly on contemporary political theology, which sadly is not the case, though I wish it would be. My article (its in swedish) is a kind of critique of the tendency in modernity to favour ”direct” contact with God over contact mediated by the church – not original though very important. I do this in a kind of roundabout way, by suggesting that we often use this modern narrative to understand early Christian ”mystics” like Isaac of Nineveh. 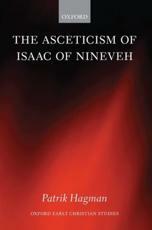 I then proceed to show hoe Isaac, by building om Theodore’s understanding of sacraments, would understand the ascetic as a kind of sacament – not the mystical experience or anything like that, but the ascetic him- or herself. Like the sacrament the ascetic according to Isaac points to the presence of the coming world in this one, and thus serves the church by making the kingdom of God present in this world.